As a premiere travel and event venue destination in York County, the Wyndham Garden Hotel offers several options for overnight accommodations. Each guest room is designed for your ultimate comfort, allowing you to experience luxury at an affordable rate. 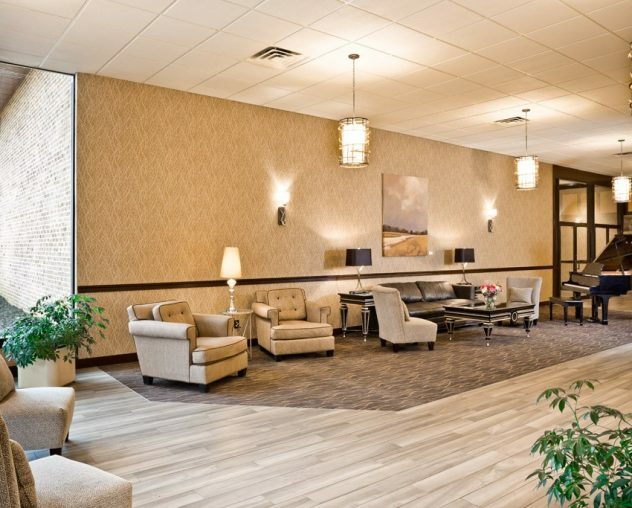 We provide a 24 hr business center, great wifi, and free parking for your convenience! 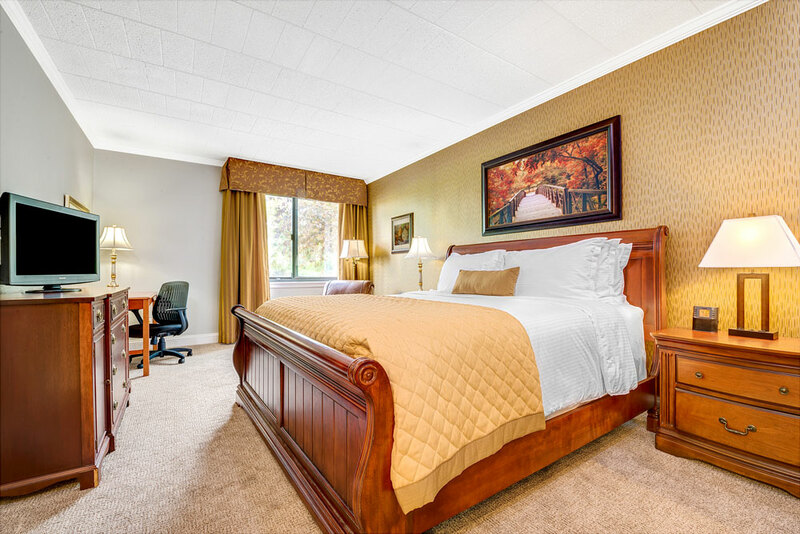 Located within distance of Hershey Park, Gettysburg, and our States Capital, choose the perfect guest room for you now by making a reservation today! As a trusted travel and event venue destination in York County, the Wyndham Garden Hotel offers several options for overnight accommodations. Each room is designed so you can experience ultimate comfort at an affordable rate. One King Bed – Lounge in style in one of our rooms featuring a king bed. You’ll appreciate the way the supportive mattress allows you to get a great night’s sleep. Two Queen Beds – Looking for a room for two, three or four guests that still offers plenty of room? Choose two queen-size beds. You’ll have lots of walking space in addition to a duo of comfortable beds complete with superior mattresses. Suite – For longer stays or more expansive room desires, book one of our suites. Suites give you several rooms, which can be perfect for many individuals and groups. Choose the perfect guest room for you now by making a reservation today! Traditional, King, Non-Smoking: This room features a king bed, as well as a pull-out sleeper sofa. If you need a work area, there is a spacious desk for your convenience. A refrigerator and Keurig are included in room’s hospitality center. The room also features a flat screen HDTV, along with complimentary wifi. Accessible, King, Non-Smoking: This room provides a king bed and adequate space. A guestroom that is ADA-compliant includes a pull-out sleeper sofa, along with plenty of workspace. A flat-screen HDTV and complimentary wifi access are provided for your entertainment. 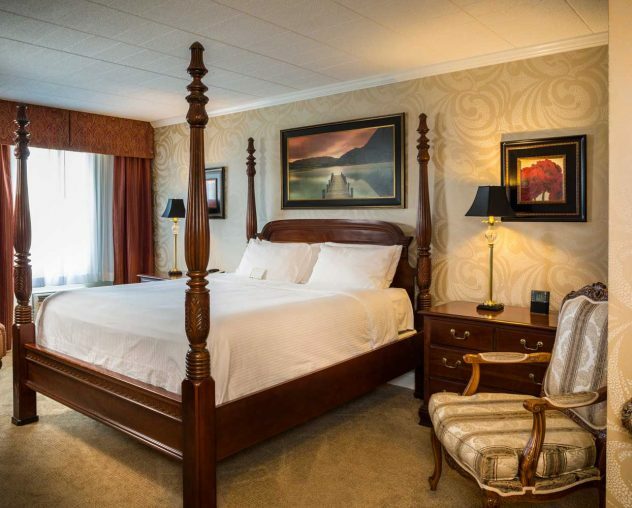 2 Queen Beds, Non-Smoking: Two queen beds are included in this spacious room option. A pull-out sleeper, as well as plenty of workspace are provided in the guestroom. A Keurig Coffeemaker and refrigerator, flat screen HDTV and complimentary wifi are other conveniences provided in each room. Accessible, 1 Queen, Bed Non-Smoking: This room provides plenty of space with a queen bed. The ADA compliant guestroom includes a pull-out sleeper sofa, along with adequate space for work — including an ergonomic chair and desk. 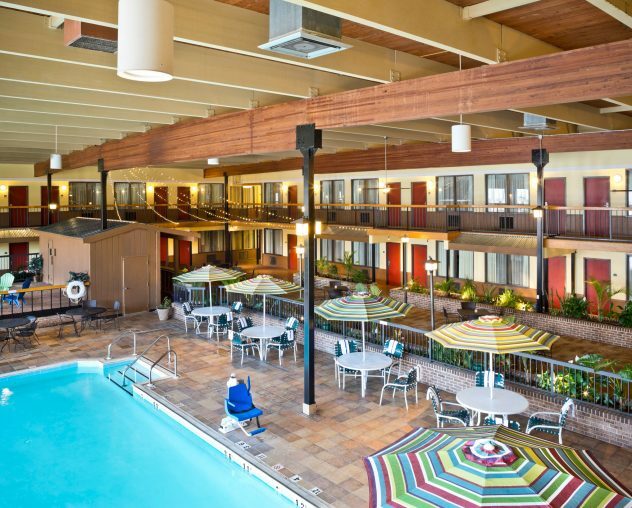 A flat screen HDTV and complimentary wifi access are also included for your convenience. Accessible, 1 Queen, Bed Non-Smoking (Roll-in shower): This guestroom features a queen bed with an ADA compliant guestroom. The room is also equipped with a roll-in shower for your convenience. The guestroom offers a pull-out sleeper sofa, plenty of workspace, as well as a refrigerator and Keurig. Other conveniences included in the room are a flat screen HDTV and unlimited, complimentary wifi access. 2 Queen Beds, Non-Smoking, Pet Free: Two queen beds, a pull-out sleeper sofa, plenty of workspace and a hospitality center featuring a Keurig and refrigerator are all included in this room option. For your entertainment, a flat screen HDTV and complimentary wifi are also included. There are no pets allowed in this room option. 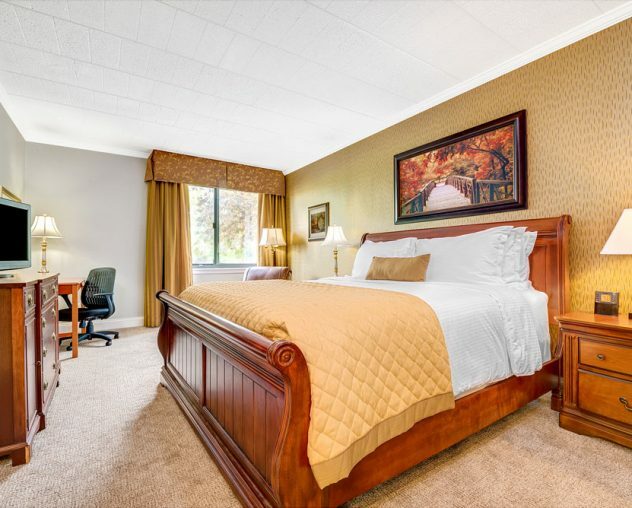 2 Queen Beds, Non-Smoking, Dark Room: Two queen beds and a guestroom featuring ample work area and a pull-out sleeper sofa come with this room option. This room is particularly ideal for guests needing ultimate light control. No windows or natural light. The room is also equipped with a sound machine for added climate control. A refrigerator and Keurig, along with an iron and ironing board are included for your convenience during your stay. Complimentary wifi and a flat screen HDTV are included for your entertainment. 2 Queen Beds, Non-Smoking, Dark Room, Pet Free: Two queen beds along with a guestroom with a pull-out sleeper sofa and plenty of workspace for your needs are provided in this room option. This room is perfect for light and climate control, as there are no windows or natural light to block out. A sound machine provides additional ambiance. As with our other rooms, a hospitality center includes a refrigerator and Keurig. Complimentary wifi and a flat screen HDTV are also included. Suite 1 King, Non-Smoking: A two room suite provides separate accommodations. A king bed and sitting area, including a pull-out sofa and dining area provide adequate space and comfort. A workspace and hospitality center — including a refrigerator and Keurig Coffeemaker — are provided for your convenience. Also provided in this room option is unlimited, complimentary wifi and a flat screen HDTV. Everyone likes to get a little extra, which is why we go the extra mile for our guests. Along with your reservation, you’ll get a hot, complimentary breakfast buffet for everyone in your party. In addition, you’ll be able to access our onsite 24/7 business center, fitness facility with cardio equipment, indoor pool, newly remodeled outdoor courtyard with fireplace and fire pit and free Wi-Fi throughout the rooms and facility.